Raileasy.co.uk is a nice comparison site which lets you find the cheapest train tickets around, for wherever you want to go, and order them easily and swiftly. Comparing a number of train companies, and with the option to book hotels and car rentals too, Raileasy tries to take the hassle out of those normally-stressful journeys. The best part is that Raileasy provides a split ticketing service that can save you a massive amount of pounds (check how it works below). Select ‘Overtaken’ Trains to find cheaper train tickets if you don’t mind travelling for longer. 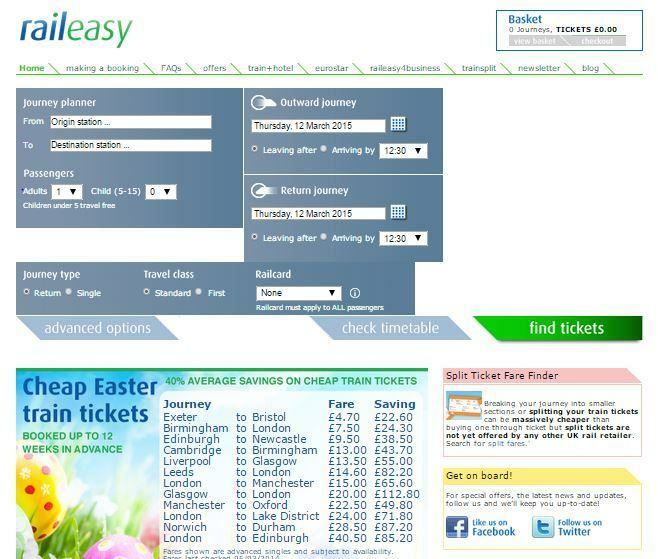 If you want to find the cheapest train tickets available then Raileasy is the website for you. If you’re on the hunt for low cost train tickets, Raileasy is the best website for you. It provides several services (train splitting and cheapest fare finder) which can save you a massive amount of money. Go back to the cheapest train tickets category to find more websites and companies offering discount deals and offers.